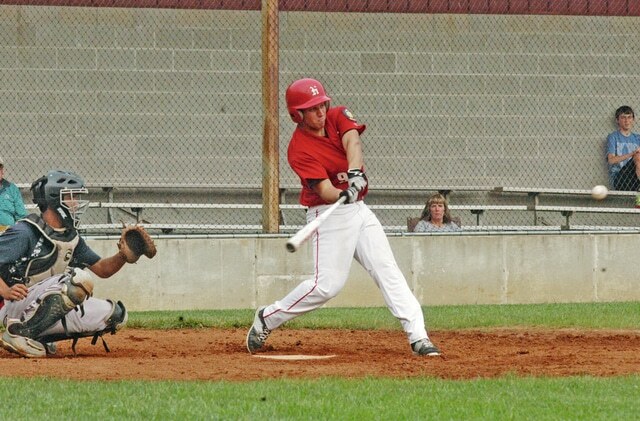 Ty Crum is shown getting ready to blast a ball for a double in Wednesday night’s game. The Hillsboro American Legion team improved their record to 5-16 on the summer with an 8-7 win over Chillicothe Post 62 on Wednesday night. Chillicothe struck first in the top of the third inning with one run but Hillsboro answered back in a big way in the bottom of the inning, collecting five runs of their own. Chillicothe evened the score in the top of the fifth, tying the game at five runs a piece after scoring four. Hillsboro came right back with three of their own in the same inning, pulling back ahead by three with an 8-5 score. Chillicothe scored two in the top of the seventh to pull within one, but they were held at bay to give Hillsboro the 8-7 win. Leading the team at the plate for Hillsboro were thrree players all with two hits a piece. Ty Crum, was 2-for-3 night including a double, two runs, and was hit by a pitch. Morgan Ryan went 2-for-3 with a double and a run, and R.J. Collard was 2-for-3 as well with a double and scored once. The Legion team will hit the road after the July 4th Holiday, playing a double-header in against Springfield on Monday, July 6 at Carleton Davidson Stadium. The first game with start at 5 p.m.